Is this a hoax? This can’t be art, can it? Is Andy Warhol an artist like Salvador Dali, or is he just some media personality who was famous for fifteen minutes or so? Or is he, as the curator of the Warhol exhibit suggests, the person who may have had more of an influence on modern culture and art than any other artist, including Dali. And while we’re at it, what is the relationship, if any, between Dali and Warhol? Do they share any similar characteristics? Curious? I was, so I visited the Warhol exhibit at the Dali. 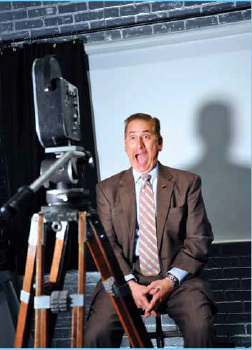 First, let me say something about the Dali. If you have not visited, stop reading this right now, and go! The Dali Museum is our treasure. It is the greatest exhibit of the works of Salvador Dali in the world and it’s right here in little old St. Petersburg. Suffice it to say you should stop everything you are doing and go there right away. And apologize to the ticket person for not having come sooner. Some friends of mine from college were visiting not too long ago, and they asked me for suggestions for something to do. I told them to go to the Dali Museum. They looked at me kind of weird. “A museum? This isn’t Paris. This is Florida. You know, beautiful beaches, tiki huts and fruity drinks. The Dali is now housed in its own building downtown, a beautiful structure as artistically unique as the paintings it houses. The gardens are beautiful. It even has its own labyrinth! Inside, on the first floor, is a great gift shop which you cannot escape visiting (on the way in and on the way out), and a coffee shop. You can sit in the coffee shop, have a latte or a cappuccino, and marvel at the “the enigma” behind you, an enormous glass bubble with over a thousand triangular pieces of glass, or the concrete stairway in front of you that extends, unbuttressed, three stories high and then some, looking like a strand of DNA. Dali was intrigued by DNA, and DNA molecules appeared in several of his paintings, so it is only right that the architecture of his museum should reflect his interests. Which brings me full circle back to the Warhol exhibit at the Dali. I don’t know about you, but I didn’t know a whole lot about Andy Warhol before going to this exhibit. I knew he was a strange guy with funny hair who lived in New York and hung out with celebrities. But that’s about it. And I knew about the can of Campbell’s Tomato Soup. My goodness, everybody knows about the can of Campbell’s Tomato Soup! 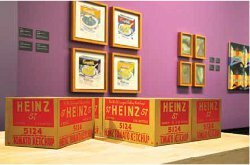 That in itself is a remarkable feat: making a painting of a can of soup an iconic image throughout the world. What else did I learn? This part is kind of like when I tell people about my latest book. I’m going to give you a brief plot outline, but I’m not going to tell you everything because I don’t want to spoil it for you. And I want you to buy the book. So here goes. 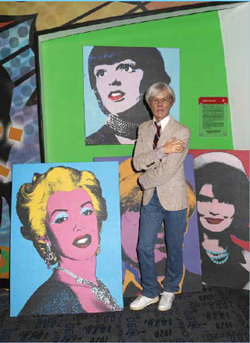 Starting out, you wonder about his work as you might wonder about Warhol himself. Is there a there there? And if so, where? But gradually, as you go through the exhibit, you get it. 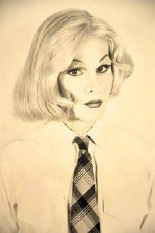 Warhol was a provocateur and a trailblazer, a man ahead of his time in many respects. What he did with photography and color and the art of silkscreening on canvas had never been done before. Silkscreen T-shirts are literally a tribute to Warhol. 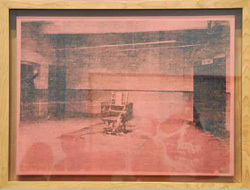 You may not get the can of soup right away, but you will get the electric chair sitting in the middle of a large room by itself in a red, rustic haze, straps hanging loose, a sign saying SILENCE haphazardly hanging in the right hand corner of the room. It will speak to you in some way, and to each of us in our own way. That’s the essence of Warhol. It’s a can of soup. What does it mean to you? Warhol’s work with film is even more intriguing. The museum has set up a great space to display films simultaneously on three walls. The center wall contains film of both the famous and the not so famous doing nothing. That’s right, doing nothing, or doing anything they want – for three full minutes! You might think three minutes is not a long time, but it feels like a lifetime when the camera is on you. And the camera is so revealing in this context. It’s just you and the camera. No scripted lines, no plot, no sound at all. Whatever emotion you show – voluntarily or involuntarily – is either up to you, or simply you being you. And you can experience this for yourself, not just by watching, but by doing. The museum has set up a camera and a stool for you to sit on, and you can be filmed just like Warhol would have filmed you. And you can keep this film for posterity. I hope I’m not telling too much, but I don’t think so. This part of the exhibit has to be experienced. Oh yes, the other two walls… to the left is what I call the kissing wall. Let me set this up for you: In movies we often see two characters we care about – characters we have followed throughout the story – passionately embrace and give each other The Big Kiss. We love it! We get it! 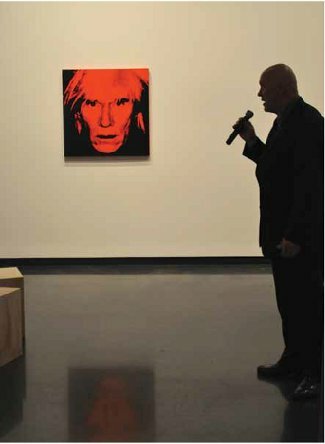 Warhol simply removed the context by removing the story. What you see is simply people kissing. You don’t know them. You don’t know why they are kissing. They are simply kissing… and kissing… and kissing. Watching is a totally different experience from what you normally see. And it’s fascinating! To the right is the sleeping wall. Warhol filmed people sleeping. Sometimes the camera is just on their belly button as it moves up and down. Or on their face as they lay in peaceful repose. It’s interesting to watch, for a brief period of time at least. Hank Hine Director of Dali gave a tour for the press. So what is the connection between Warhol and Dali? The most obvious is that both men were flamboyant, definitely outside the mainstream, and both sought the spotlight of media attention. They were both literally a “piece of work” unto themselves. Warhol with his wild white hair, and Dali with his provocative handlebar mustache. 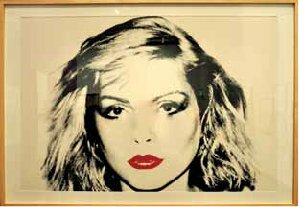 Warhol was a much better media manipulator, however. He hung around with celebrities, photographed celebrities, and photographed himself with celebrities. That combination, along with his avant garde art, brought him celebrity. Dali was also was part of the celebrity world, but although Dali’s art is unique and phenomenal, it was never part of the mainstream like Warhol’s. The messages in Dali’s paintings are a little more obscure. You have to do a little searching for those gems. And here is the kicker: The two men knew each other. There are some photos in the exhibit of Warhol and Dali together, the two of them preening for the camera. They were quite a pair. So go, enjoy, and give thanks that we have such treasures in the ’Burg!